Apply by April 3rd. Funding support for registration and travel! Download the promotional poster here. With generous funding support from the Saskatchewan Community Initiatives Fund, the Saskatchewan Literacy Network is pleased to announce the Northern Family Literacy Training Support Program. We are looking for four northern Saskatchewan community teams of up to four people each to participate in a 3-day training opportunity from May 15th to 17th, 2018 in Air Ronge, SK, at the Pahkisimon Nuye?áh Library System (PNLS) Headquarters. After the training, participants receive ongoing support in creating or enhancing family literacy programming to add to the strengths in their community. · are prepared to commit, as a team, to use the knowledge from the 3-day training to offer (new or enhanced) family literacy programs or events in your community. 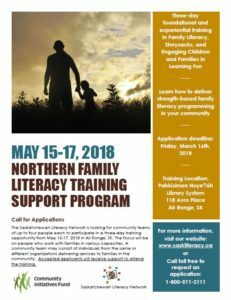 We will select 4 teams of up to 4 people per northern community (up to 16 people total at the training) to attend the Northern Family Literacy Training Support Program (NFLTSP). The focus will on be on people who work with families in various capacities. A community team may consist of individuals from the same or different organizations delivering services to families in their northern Saskatchewan community. Family literacy refers to the intergenerational learning that takes place within the family. Family members use language and literacy skills to learn, play, and work together in their home and community. Family literacy focuses on the role of parents and caregivers as a child’s first teacher. This powerful influence fosters language development, and the intellectual, emotional, spiritual, and physical growth of each child. Everyday life brings opportunities for learning together. Family literacy activities help families build relationships, gain skills, accomplish work and participate in their communities. You can find more information and resources on family literacy here. · participants gain confidence to help families engage with schools, libraries, and other organizations. · the knowledge and skill you develop during this training will help you deliver effective, strength-based, family literacy workshops in your community. What expenses will be covered for accepted applicants? · training materials and resources will be provided. · NFLTSP Call for Applications 2018 - Fillable PDF (2 pages at end of document). · One letter of reference (for example from the community organization or band office where the family literacy programming will take place). Deadline for applications: Tuesday, April 3rd, 2018 at 11:59 pm. We thank all applicants for their interest. Only applications which are completed in full will be considered by the adjudication committee. Accepted applicants will be notified by Thursday, April 5th, 2018. Apply by email: saskliteracy@saskliteracy.ca OR apply by fax: 1-306-651-7287. Thanks again to the Saskatchewan Community Initiatives for their support of this Program, and to the Pahkisimon Nuye?áh Library System (PNLS) Headquarters for partnering with us to deliver this training.